Warmer Kringleville home one of many ways Revitalizing the Energy in Maine has helped other nonprofits, public. 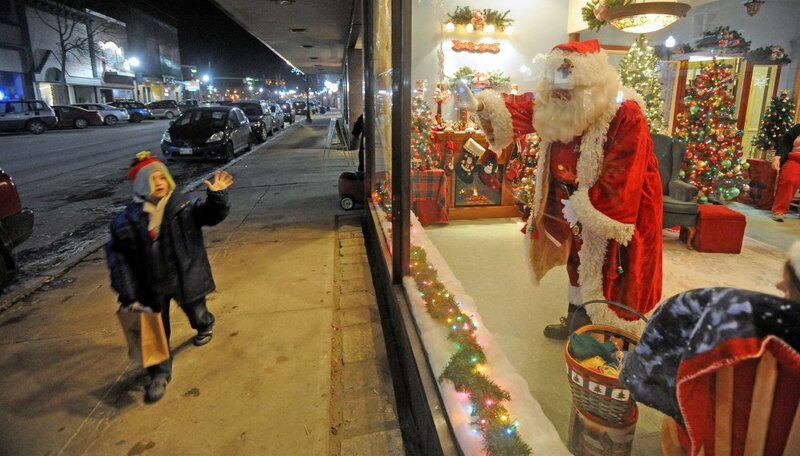 WATERVILLE — On a frigid Wednesday night, a man dressed as Santa stood inside the downtown storefront window of The Center, waving at passing children, bundled up from the cold. In years past, the children and their parents waited outside to see St. Nick in a hut in the center of nearby Castonguay Square. The change to an indoor location, a welcome addition to the holiday season for the visiting families and volunteers alike, was made possible by Revitalizing the Energy in Maine, known as REM. The nonprofit volunteer organization has aimed to make central Maine a more connected and collaborative community for the last 18 years. During that time, REM has worked to develop the greater Waterville community by beautifying the downtown area, helping with the city’s annual events such as the Santa visits, transforming the former department store into a multi-use community building and helping support new nonprofit organizations. One organization that has flourished with the help of REM is Kennebec Messalonskee Trails. What started as an idea at an REM meeting turned into its own nonprofit organization, according to Peter Garrett, founder and president of the trail group. It builds and maintains walking, running, cycling and cross-country ski trails along the waterways of Waterville, Winslow, Benton, Fairfield and Oakland. “We got the trails project up and going at REM in 2000, and in 2003 it occurred to us that we needed to set up a nonprofit with the mission of building trails,” Garrett said. While the organization was taking the necessary steps to get its federally tax exempt status, REM helped nurture it and grow. The partnerships REM has with other start-up nonprofit groups in the area is familial, according to Garrett. Through the years, REM has helped local organizations, including Colby College and Inland Hospital, by publicizing upcoming events and providing space if needed. REM helped the former Colby Craft Fair find a series of new homes in town as the REM Craft Fair in 2009, after the college’s parents weekend grew too crowded to host the fair. REM gets no funding and none of its volunteers are paid, which is a unique setup, according to Scott Schnapp, executive director of Maine Association of Nonprofits, which works to strengthen the leadership and organization of Maine nonprofit groups. REM works closely with more than 50 organizations, including the Waterville Opera House, Waterville Main Street, Habitat for Humanity and Maine Children’s Home, bringing people together to make changes to the surrounding communities through organized events, fundraising, nonprofit startups and other outreach programs. On the first floor of the Center, behind the Maine Made & More gift shop, REM’s main office is cluttered with paperwork from organizations that REM has helped — from Kennebec Messalonskee Trails to the Women’s Initiative, a project that provides a comfortable, nurturing place for women to make crafts and enrich the community. “We’re a lot like a nonprofit incubator because we take a lot of that responsibility for you,” said Faye Nicholson, REM’s founder and executive director. Nicholson came up with the idea for REM after brainstorming with hundreds of residents in 1995. The idea for REM started when Nicholson and her husband, Jim Nicholson, were looking for ways to get people to shop locally and they started to advertise. “Anyone who wanted to come and talk with us about what they think about the community, we’d put them in the ads,” Nicholson said. During that year, Nicholson talked to more than 300 people. Five people work daily at the REM main office at The Center, including Nicholson and fellow executive director Jackie Dalton, as well as three assistants who help organize the rental opportunities. However, there are many more people out of the office who help maintain REM’s purpose, according to Nicholson. “We have about 150 people who consistently work to make REM better, whether it be maintaining the website or helping with promotions,” Nicholson said. None of the people get paid — REM is 100 percent volunteer-based, Nicholson said. There are times when volunteering may get spread thin or events aren’t well-attended, but Nicholson looks on the bright side of that. In her office, a room in the back of REM’s office, about a dozen dream catchers hang from Nicholson’s wall. 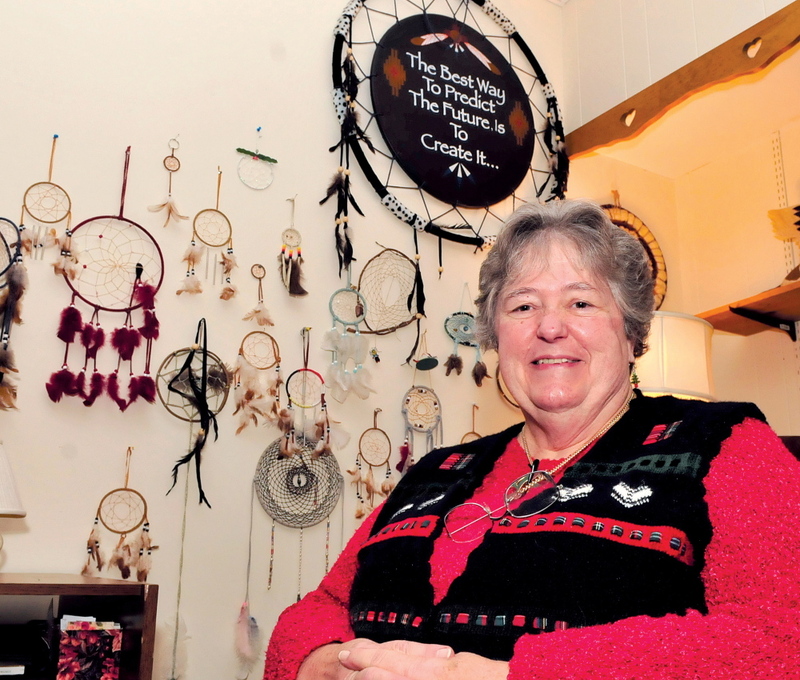 While her official title is executive director, Nicholson calls herself the Dream-Catcher-in-Chief. For her work growing REM over the last 18 years, Nicholson hasn’t been paid a dime. But she didn’t start talking to people in 1995 about the community with the idea of making money. “If you were to fill a building with money and say OK Faye, you can take the building of money or you can work with REM, I’d choose REM every time,” Nicholson said. One of the first objectives for REM was to find that central location for people to meet and exchange ideas. After Sterns Department Store closed on Main Street, a group of community members developed the Waterville Regional Arts and Community Center to buy and renovate the building. The regional arts board, of which Nicholson was a member, raised $1.2 million to make the purchase and turn it into a mixed-use building with retail space, professional offices, a theater, dance studio and meeting rooms. REM is independent of the regional arts board and one of more than a half-dozen businesses and organizations that rents space at The Center, including the Maine Made & More gift shop, the Waterville Opera House’s studio theater, and Community Dental Center. In addition, Waterville City Hall holds its City Council meetings in rented space at The Center. REM pays $32,000 per year to rent space in the building and keeps portions open for public and private use. The rental space is what REM relies on for most of its funding throughout the year, as the organization receives no state or city funding. The organization maximized the amount of space in The Center it could rent to the public, including The Forum, an open banquet setting that can seat 86 people with tables or 100 people in rows, as well as the REM Board Room, which seats 32 people. In addition, REM’s revenue comes from additional amenities that can be rented at The Center, including a kitchen area. If no one wants to take the time to cook, REM offers catering and can cater to any event, large or small, according to REM’s website. Beyond the rental units, REM’s main source of funding is through donations. “A person who gives $5 or a person who buys a cookie from us, doesn’t even know the thousands of ways they’re helping us,” Nicholson said. Even though REM relies mostly on rental fees and fundraising, funding hasn’t been a problem for the organization, mainly because it’s cautious with its revenue. While REM works throughout the year to help bring community ideas and activities to fruition, the holiday time is where REM’s work is most vivid. In addition to an annual gingerbread house decorating, REM hosted Mrs. Claus’ children’s play area in the center during the Parade of Lights that starts the holiday season. This year, REM is also helping to collect presents to donate to the Family Violence Project, which helped more than 7,000 people in central Maine last year. REM’s latest project is transforming a storefront at The Center into picturesque Kringleville. A month-long celebration of Christmas and Santa Claus, Kringleville is a holiday tradition in Waterville — a place where families can bring their children to ask Santa those last Christmas wishes in person. This year, Kringlevilee is a quintessential partnership of community organizations. Partnering with Waterville Main Street, which organizes the Parade of Lights and Kringleville, the two organizations worked together to move Kringleville inside from the cold. “Waterville Main Street came and asked us what we thought about them using our space for Kringleville,” Nicholson said, adding that REM was initially hesitant because of revenue it would be giving up, as the space was often rented for office parties during the holiday season. “We decided to do it because it saved money by not needing to build Santa’s house outside and, more importantly, it kept the children who were waiting warmer,” Nicholson said. This year’s Kringleville inside the storefront was an experiment, according to Jennifer Olsen, director of Waterville Main Street. Any changes to holiday traditions have to be done with care, she said. Since it opened the night of the Parade of Lights, the new, warm Kringleville has been lauded with generous reviews on Kringleville’s Facebook page. The storefront at The Center looks like Santa’s wonderland. More than a half-dozen Christmas trees decorated in colorful ornaments and lights were strewn throughout the room. Snowflakes dangled in the window while garland wrapped in twinkling lights rested on the windowsill. In the corner of the room, Santa’s evergreen-colored throne sat majestically, away from the cold air and shielded from the bitter winds.